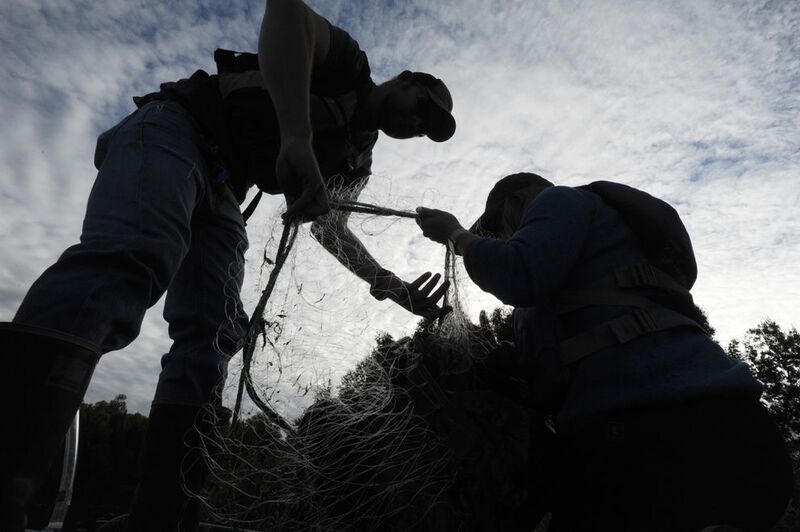 State fish biologists spread gillnets in Anchorage's Sand Lake on Thursday to capture any bass that might be there, after an angler Monday night caught a juvenile bass, a predator that's not native to Alaska and could threaten other fish. "Wanted! 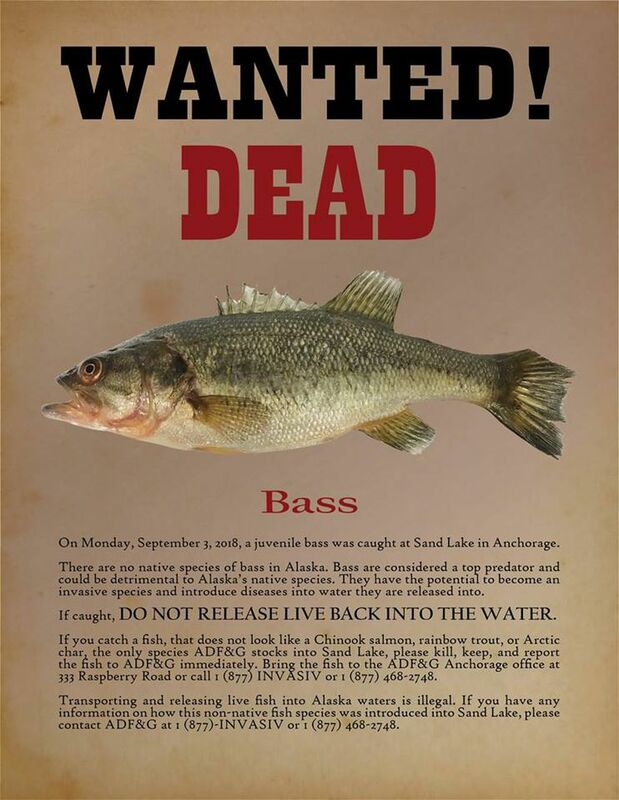 Dead," exclaims a poster on the Alaska Department of Fish and Game's Facebook page, with a picture of a bass and a message to anglers to kill any they catch and call the agency. "They have the potential to become an invasive species and introduce diseases into water they are released into," said the poster. The poster does not offer a monetary reward. It does, however, note that transporting and releasing live fish into Alaska waters is illegal. That appears to be what happened here. 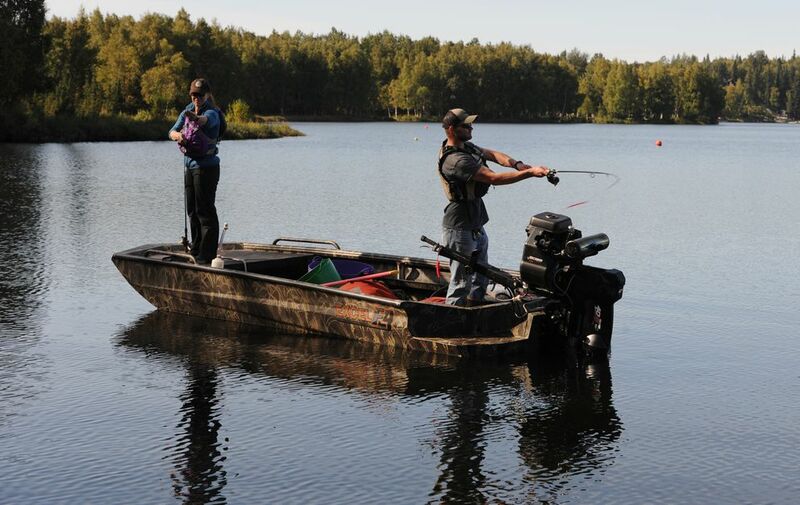 "Clearly it had to do with an illegal introduction of bass, because there's no other way bass could get into this lake," said Kristine Dunker, a state fishery biologist, during an interview when she wasn't stretching nets onto the lake. The agency came up empty-handed in its hunt for bass Thursday, but it plans to continue fishing in the coming days, Dunker said. In addition to using nets, biologists are fishing by rod, using bass tackle. They also want to know more about who brought the bass to the lake. "We are asking if anyone has information about how the bass were introduced and that they let Fish and Game know. We want to know how many put in, where they came from," Dunker said. The fish caught Monday appears to be a large-mouth bass. A genetic test is planned to confirm that, she said. The agency has never heard of bass in Sand Lake. There's a fear the fish could become a problem akin to northern pike, an invasive species in Southcentral Alaska that biologists have spent years battling, said Tammy Davis, Fish and Game invasive species coordinator in Juneau. Both fish are valued by recreational anglers, but they are "top predators" that can endanger other fish and compete with them for food, Davis said. In Southcentral, northern pike prey on trout or salmon that lack defenses to pikes' "predatory tactics," the agency says. Pike in the region have taken over some lakes and streams that once supported salmon and trout. 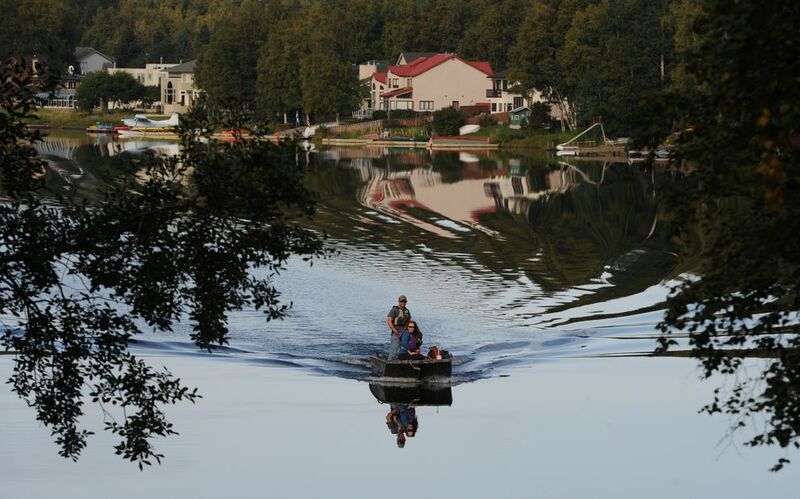 "Our fear is it's not just one bass, and that someone or some people think it's OK to bring a non-native species into Alaska and introduce them into Alaska waters," Davis said. "It's illegal and the implications can be significant. We've seen that with northern pike in Southcentral, where we've had to close fisheries." "Our primary concern at this time is to determine if there are others, and more importantly, if there is evidence of a reproducing population," Dunker said. Anyone at the lake who catches a fish that does not look like a chinook salmon, Arctic char or rainbow trout, the only species the Fish and Game stocks in the lake, should call the agency at 877-468-2748.